An Uzbek oven makes a long journey to its new home. 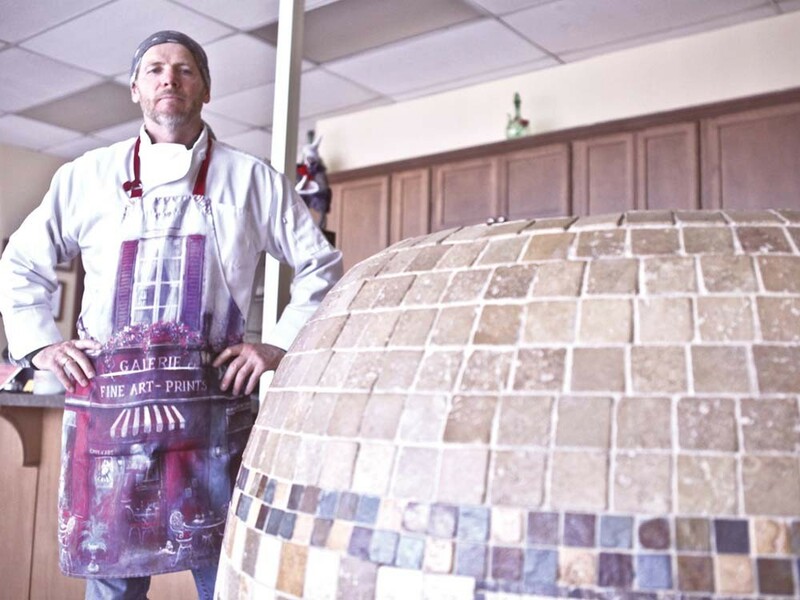 Asian Cafe owner Andrey Chumov stands beside the tandoor oven in which he makes meat-filled pastries or samsas. Catchy Russian music plays in the background, and Raya Yuryeva stands behind the counter, waiting to greet customers. With smooth olive skin, high cheekbones and smiling eyes, she’s just one of the beauties at Asian Café on East Sprague. The second is a hefty 500-pounder that stands watch over the dining room. With lots of curves and striking earth tones, this creature’s beauty is more utilitarian: The round Uzbek tandoor oven turns out flaky, meat-filled pastries called samsas. There’s a second, larger tandoor in the kitchen, used to bake crispy-chewy lepeshka bread topped with black and white sesame seeds. The decorative-tiled tandoor takes center stage in the restaurant, complemented by the ceremonial black velvet robes with luxurious gold embroidery that line the walls. The six-table restaurant specializes in cuisine from Uzbekistan, Kazakhstan and Kyrgyzstan, all former Soviet republics. Built in Tashkent, Uzbekistan, the ovens were shipped by plane to New York, where they were loaded onto a semi-trailer bound for Spokane. “We built a special cart on wheels to bring it in and it took eight men to lift it into place,” says Andrey Chumov, who came to Spokane from Kyrgyzstan in 1992. Chumov owns Asian Café with partner Nukyz Bapaeyva from Kazakhstan. These fiery furnaces can reach temperatures of 1,000 degrees Fahrenheit. The 10-inch-thick walls are layered with bricks and clay mixed with camel’s hair, which acts as a binding agent and has been used in making tandoors for 3,000 years. “It is proof that natural material works,” Chumov says. Originally trained in construction, Chumov began ruminating on the idea of a Central Asian bakery and café about 10 years ago. “I was baking bread at home and people really liked it,” he says. Before opening his restaurant last February, Chumov enlisted the help of an Uzbek chef from New York to teach him the meticulous process of working with the dough. Factors like the dough’s texture, salt content and temperature, along with the temperature of the oven’s walls, must all be perfect for the pastry to adhere to interior of the tandoor and release properly to produce a delicate flaky pastry. “I was a student of samsa for three months,” Chumov says. In addition to selling samsas, lepeshkas and other specialty breads at his café, Chumov is licensed to sell the bread wholesale to local grocers. The café benefits from shoppers who stop by for bread or lunch after a trip to Mariupol Russian market, which is located next-door. Along with breads and pastries, the café offers lunch and dinner (same menu). Entrees ($4-$12) include beef, lamb and chicken dishes, soups, salads and dumplings. The Meal Special ($10) is a great way to try several dishes and comes with a pot of tea. As I puzzled over the sauces and vinegars that accompanied the food, my server offered some help. “Take a bite of the samsa, now pour some sauce on it,” Raya instructed, handing me a bottle of a ketchup-like condiment with cilantro and spices. Samsas can be eaten at any time of day, even with coffee, she tells me, explaining that every family in Uzbekistan has a tandoor outside to bake bread and samsa. Chumov’s hard work was evident in each bite of the flaky, savory beef and onion pastry. The beef shashlik — a knife-like skewer of buttertender grilled beef seasoned with paprika and vinegar — was equally impressive, thanks to Chumov’s brother Pavel, one of the chefs. By the time I polished off the shorpo, a peppery soup with tender chunks of beef, I was ready to take my shoes off and crawl up onto the topchan, a family-sized couch with pillows and a low table where families can dine and recline. Although several Russian restaurants have come and gone in Spokane, Asian Café is unique as the city’s first Central Asian restaurant.